The market is giving some mixed messages right now. 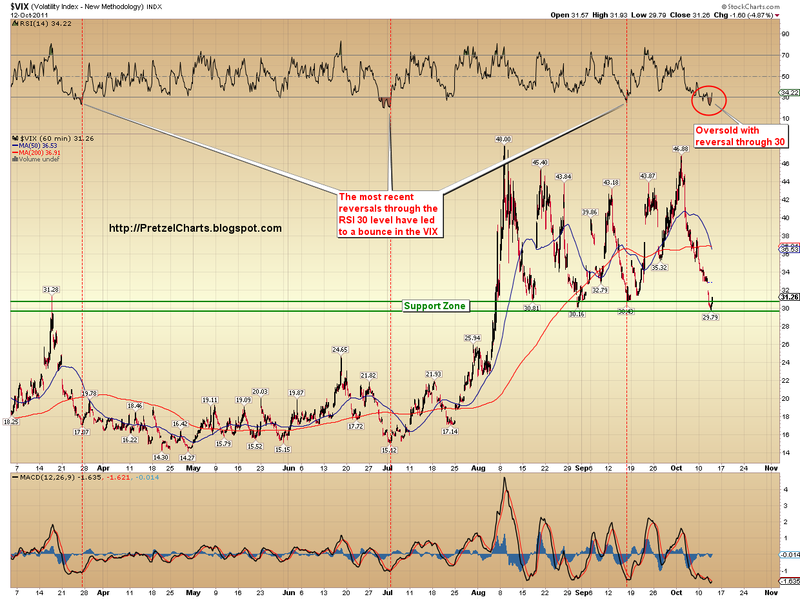 The Volatility Index (VIX) and Nasdaq 100 (NDX) seem to be saying that the rally needs a breather. 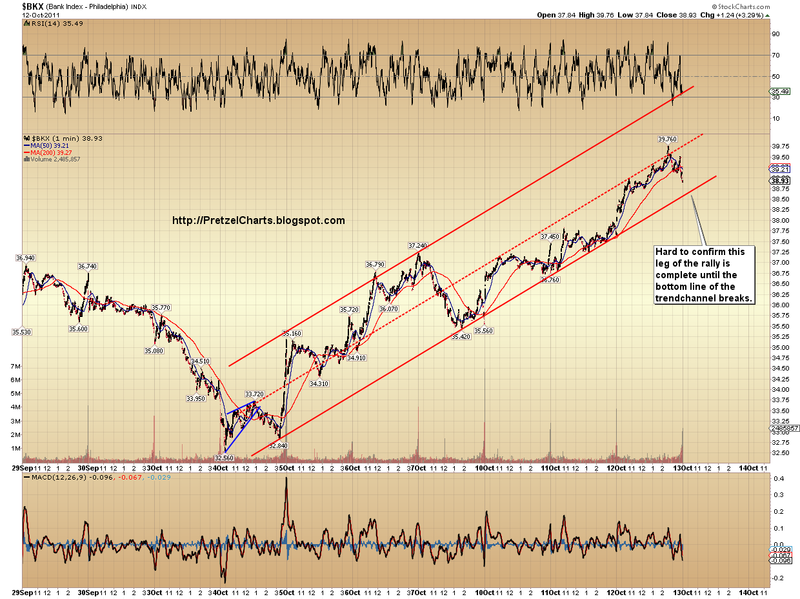 The S&P 500 (SPX) and the Philadelphia Bank Index (BKX) seem to be saying, "Maybe. Not so fast." Let's look at each one in more detail. Wednesday's high fell 5 points short of my target range for the NDX (2337-2380). However, the wave structure can be counted as complete, so I'd assign a fairly good probability that yesterday marked the top of Wave A-up of Minor (2) up. But the waveform allows for some more bullish interpretations, so I cannot yet rule out a last gasp high up into the target zone. 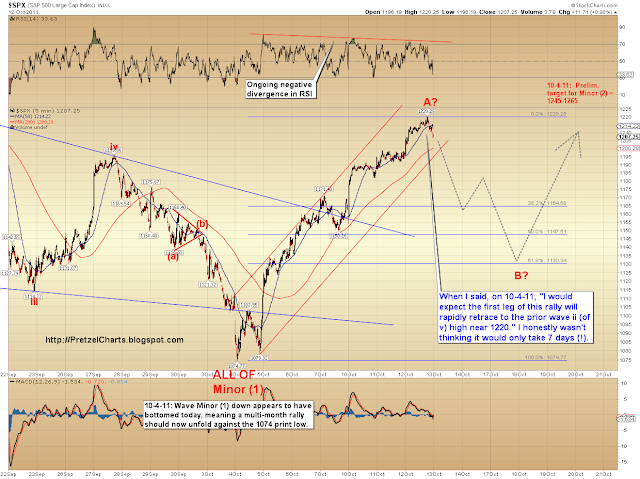 In the intermediate picture, it does appear reasonable to assume that the SPX and the NDX have both completed the first leg (Wave A-up) of the expected counter-trend rally (Wave Minor (2)-up). Minor (2) should ultimately have three legs (A-up, B-down, C-up). There are several indications that the second leg (Wave B-down) may be starting now. The second chart is the 1-minute NDX chart. I've been updating this chart each day for several days, and was pleased to see that my hypothetical trendchannel seemed to be validated by the price action on Wednesday, as the market broke through it, then back-tested it and failed to rally above it. The waveform which I've been labeling and projecting in real-time now appears complete. My only lingering concern is that the market fell just a bit shy of my projection of 2337-2380, so I'm not ready to state with unequivocal certainty that the this leg up is over... however, I would assign a 70% probability that it's complete. Obviously, any move above the 2331.91 high would indicate that the current wave up is still unfolding. I have posted a preliminary target box for Wave B-down (note that it's not a time-target -- I certainly don't expect Wave-B to complete tomorrow). The minimum work expected of a B-wave would be a 38% retracement of the prior move, which equates to roughly 2220. B-waves are tricky and somewhat unpredictable, though. 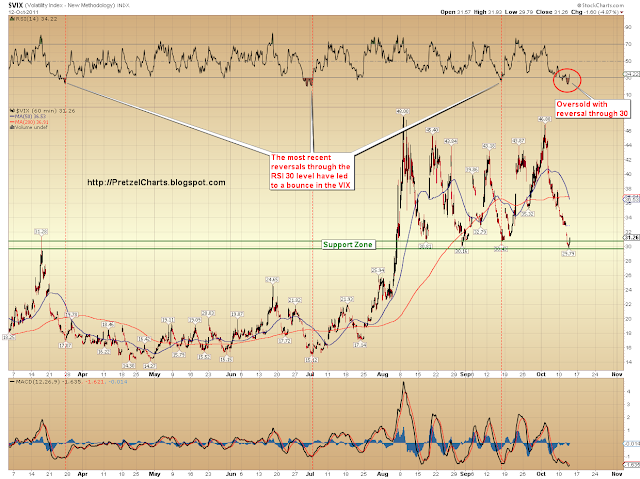 B-waves can actually retrace up to 138.2% of the prior move, and still be within acceptable guidelines. They often form triangles or other difficult-to-predict patterns. B-waves are the Claus von Bulows of the Elliott world. As the wave unfolds (assuming this is B), I should be able to come up with more accurate projections. 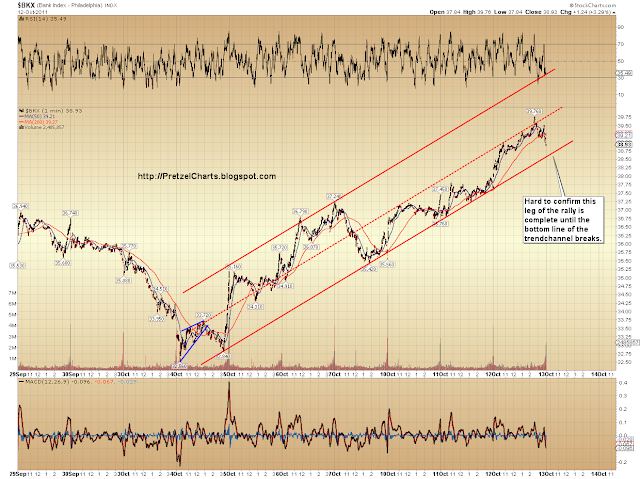 The SPX may also have completed this leg of the rally, but unlike the NDX, it hasn't broken out of its channel yet. 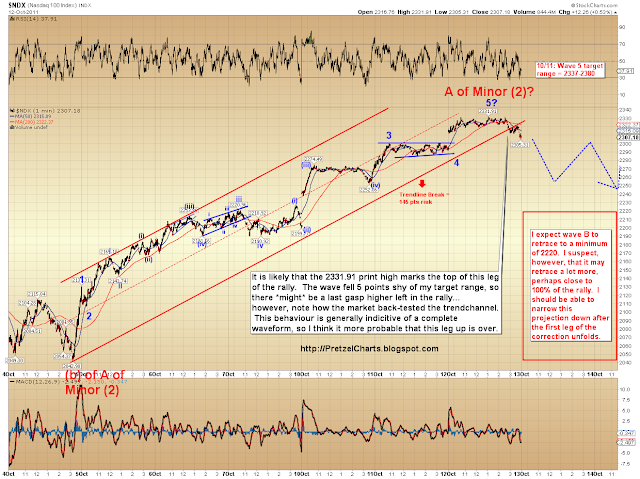 To confirm that a waveform is complete, the channel break is almost a requirement in Elliott Wave. Impulse waves usually (but not always) travel in channels formed by either the peaks of the 1st and 3rd waves, or the troughs of the 2nd and 4th waves. 5th waves often fail near the median line of the channel and complete the move. The channel break then acts as confirmation that the current wave is over, and the next wave is underway. The same issue holds true for the BKX: it is still within its channel. The move did peak with a brief throw-over of the median line, so that looks very promising -- but with the BKX in particular, there is some question in counting the move as complete. So I'm going to let the lower line of the channel be my indicator in that regard: since the BKX has actually tested its channel many times, that gives it much more weight as a meaningful support line. When the BKX breaks, expect the rest of the market to do the same. We also typically get a fall post Options closing this week. The Index Put / Call Ratio touched 2 yesterday. 100 Co's are announcing results next week, so Sell the NEWS may be the way next week coinciding with the B wave down.